Huntress and Power Girl depart to have a discussion about Harry Sims since he appears to be at the heart of everything that's been going on in Gotham of late. Power Girl is still not convinced he can be trusted even if he is a 'friend' of the Huntress. Huntress nonetheless decides it's time to get answers and decides to pay Harry a visit herself, but in her civilian identity. In his office, Harry Sims is still feeling uneasy about discovering Helena's superhero identity, but his unexpected visitor makes him feel even more scared. The Thinker walks into Harry's office unnoticed and reveals to him that the sudden crime wave in Gotham was a test he conducted to see if his thinking cap had the power to 'influence minds predisposed to a given action.' He once again tries to blackmail Harry into declaring costumed superheroes illegal vigilantes, but Harry refuses to oblige. This causes the Thinker to induce an angina in Harry's chest as a warning of what's in store for him if he continues to withdraw his cooperation. The Thinker leaves the office unnoticed, but Helena Wayne (who is waiting in the lobby) does notice the sound of two doors opening and closing without an actual presence. Helena starts to ponder about the sound of the two doors and deduces that either there's a 'secret entrance' to Harry's office, or she's hearing things. Preferring not to think she's gone crazy, she decides to investigate the matter further as the Huntress, especially since Harry refused to see her as well as all his other appointments. She calls Power Girl to join her in her investigation. Huntress fills Power Girl in on what transpired during her visit to Harry's office in her civilian identity, though Power Girl doesn't understand why she insists on clearing things up with Harry. Huntress clarifies that she wants to learn the whole truth behind his strange behaviour and whether or not this relates to the crime wave happening in Gotham. She intends to get answers one way or another. Both women notice Harry at his window, looking like he's contemplating suicide. Harry is in fact contemplating suicide, but quickly changes his mind when he realises he still has things he wants to live for. The Thinker, however, gets him to fall out the window anyway by once again inducing an angina, this time from a distance. Power Girl catches him, but Harry quickly reveals he knows Huntress' identity when he--in a panic--pleads for her to help him. Review: This is admittedly a very strange chapter, namely because Paul Levitz tries to cram too much into an 8-page space, and things don't exactly flow together the way he intends. Had he more pages to properly flesh out the story, that could've made a huge difference in getting a smoother execution of ideas. One of the biggest flaws in this chapter is The Thinker's ultimate game plan isn't actually made clear. To start with, he contradicts his earlier plan to steal some plates of value to sell to the foreign market by deciding that he actually wants Gotham's superheroes to be prosecuted as illegal vigilantes. But then, his plan for making this a reality makes no sense. How does inducing a crime wave all over the city of Gotham supposed to prove his point about superheroes being illegal vigilantes, when he actually created a situation that facilitated their necessity? 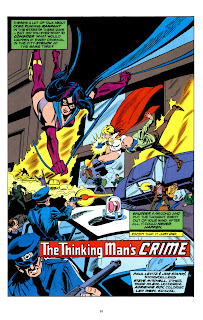 Alone, the law enforcement officers would've spent the entire day stopping criminals, but with the help of the Justice Society, they would've stopped the problem sooner, and they would've especially captured the Thinker. Another thing that goes unexplored in this chapter is Harry Sims' own personal stake in the Thinker's plan. Why did he initially agree to propose a bill that would prosecute costumed superheroes as illegal vigilantes? What was in it for him? Did he have a personal dislike of superheroes? If so, why is that? Does he feel crime should be prosecuted under the established law, or has he had issues with them in the past? This is one area that could've definitely benefitted from further developing Harry's character to acquire a greater understanding for his motivations in this story. As of this chapter, he primarily exists as a love interest to Helena Wayne, but even that's not given proper development as we already discussed in the last review. Another thing that suffers from poor execution in this chapter is the conflict between Huntress and Power Girl over Harry. Power Girl clearly doesn't like him, and Huntress knows this, but the dialogue between them is strange. They'll talk about one issue and Power Girl will respond to that issue with something completely unrelated. This was most noticeable during the scene where the Huntress addressed her concern about the police being distrustful of them, and how the world at large tends to be generally distrustful. This prompted Power Girl to accuse the Huntress of making excuses for Harry, even though they weren't actually talking about Harry. At best, it looks like Levitz was trying to establish Power Girl as 'seeing between the lines,' but instead she comes off as living up to the 'feminists are irrational women' stereotype, which regrettably throws her character under the bus. The fact that Levitz tries to present Huntress as the more level-headed heroine especially does Power Girl no favours. All in all, despite the author's best intentions, this second part is very much a weak spot in this story, namely as a consequence of trying to establish new information without the sufficient space to properly develop it. At some point, I think even Levitz forgot what story he was writing since the Carole sub-arc was suddenly dropped in this chapter (and later revisited in a later story arc) and the Thinker suddenly forgot he originally wanted to steal some plates. Levitz does try to keep his ideas consistent, but isn't too successful in the execution.